Zong introduced Pakistan’s first Accidental Life Insurance via mobile phone in collaboration of Adamjee Life Insurance Company. 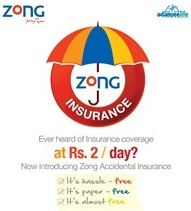 It is very easy to subscribe for Zong Insurance and no documentation involved in it. Zong is a Trend-setter telecom company and Adamjee Life is a leading insurance company in Pakistan with over 35% market share. Three different insurance plans are available. There is no need to make any insurance premium deposits as the daily deduction will be automatically made from your mobile phone balance according to the Insurance plan. Any Zong customer of age 18~59 years with a valid CNIC can subscribe for this offer. Zong connection should be registered with the name and ID card of the beneficiary. Insurance policy is valid for 1 year and premium is non-refundable. How to Subscribe, Unsubscribe and Claim? Zong customers can easily subscribe to the insurance service by sending a SMS. Send SUB for subscription, UNSUB to unsubscribe and CLAIM to 5433 to claim the policy in case of accident. To complete the registration, customer will be prompted to confirm his CNIC number. After verification of CNIC number the user will be allowed to choose from 3 plans. The user can add beneficiary’s details and receive the policy number after confirmation. Insurance charges will be deducted automatically from the customers’ mobile phone balance daily. In case of accidental death or disability, user can claim for insurance policy either by sending SMS from the same Zong number or by filling out a form at any Zong CSC. For more details, call 310 from your Zong number. You need to consider how your premiums will be paid if you’re disabled in an accident or you develop a dangerous illness which makes it impossible because you to keep going doing work. These stupid corporate sector mobile companies leaves no opportunity unturned to grab even single penny from the already deprived masses of Pakistan. Like credit card schemes of banks, theseis another looting methodology, which such profit oriented companies adopts at the cost of general public/ lay man. Insurance or Takaful is a community based beneficial schemes, if adopted in true spirit of social welfare, and governed by the proper Management or Corproation, but not these Looters i.e. Mobile Companies. I beg to differ, I think that life insurance is needed for people to be safe and secure. Thanks.